There’s plenty to say during and about an event like Martin Luther King Jr. Day, a celebration that at Bates is so rich in revelations, recollections, and reminders. Of course, it’s impossible to share all the great words we heard during MLK Day 2019 — but here are some that seem to sum up important messages from the day. 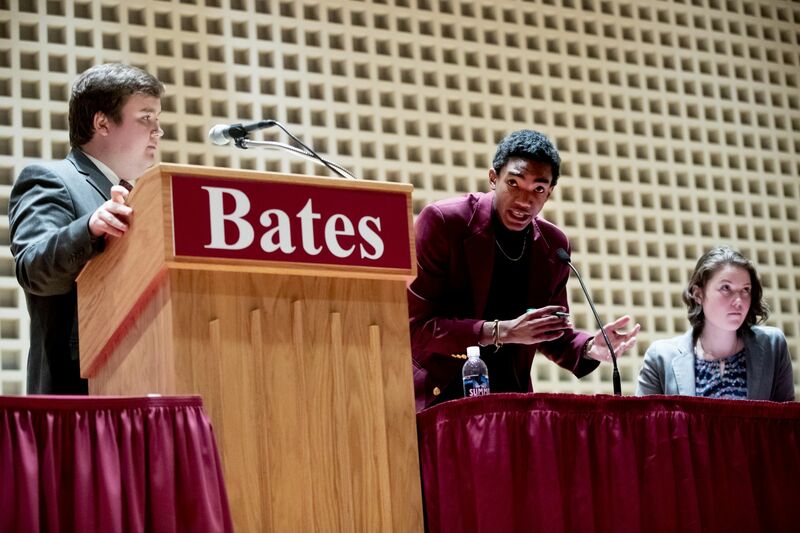 The work to achieve greater equity within the Bates community, for all members of our community, is an ongoing process. 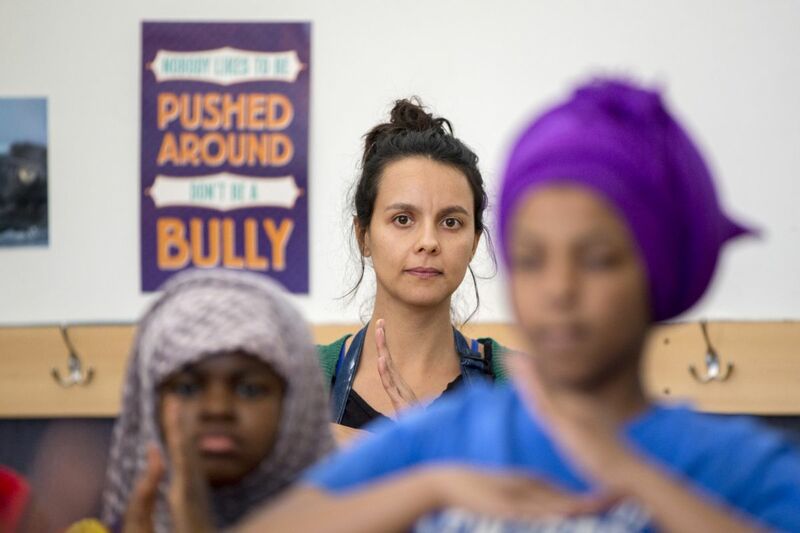 While this and other stories of MLK Day 2019 show progress and community engagement, we are mindful that much work remains ahead. When audience members were invited to ask questions, one man asked why it has to be one or the other. Harry Meadows ’19 of Princeton Junction, N.J., suggested that debating the issue is less about choosing sides than helping people understand and refine arguments that, ultimately, will have an impact on real lives. Pora, a member of the Sisters of Mercy who works with Spanish-speaking immigrants in Maine, spoke during an afternoon panel featuring local and state advocates for immigrants. Central to Pora’s work is the concept of acompañamiento — “walking with,” a theological term that emphasizes solidarity, vulnerability, and recognizing humanity. “Accompany them to immigration check-ins or the Boston court, because there’s a lot of insecurity there,” Pora said. “Don’t play lawyer.” Instead, refer them to expert legal resources for immigrants. During a morning presentation, McLean, Areohn Harrison ’20 of Rockville, Md., and Justice Prewitt ’20 of Memphis, Tenn., talked about mentoring middle-school boys at Hillview, an apartment community a couple miles from campus. The mentoring program was sparked last year during an after-school program at Hillview, when boys started asking pointed questions about race, crime, and poverty. 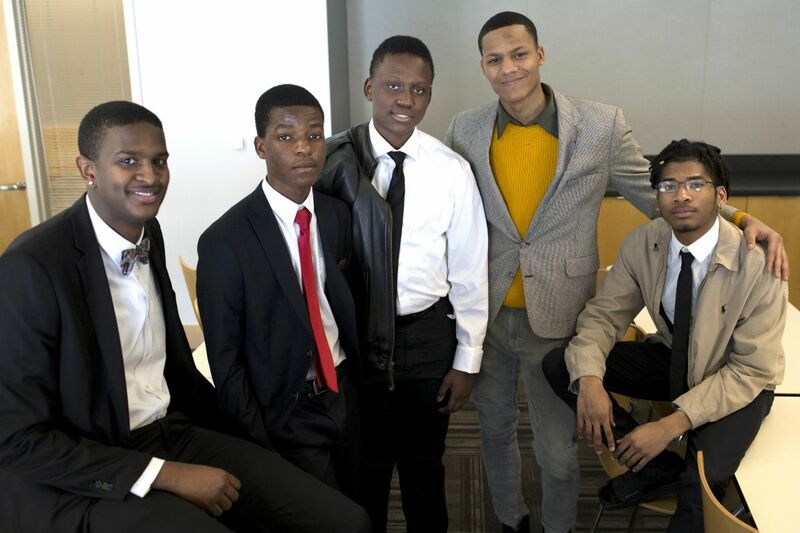 In response, the three Bates students began a formal mentoring program, helping the boys tackle issues of racism and bias. 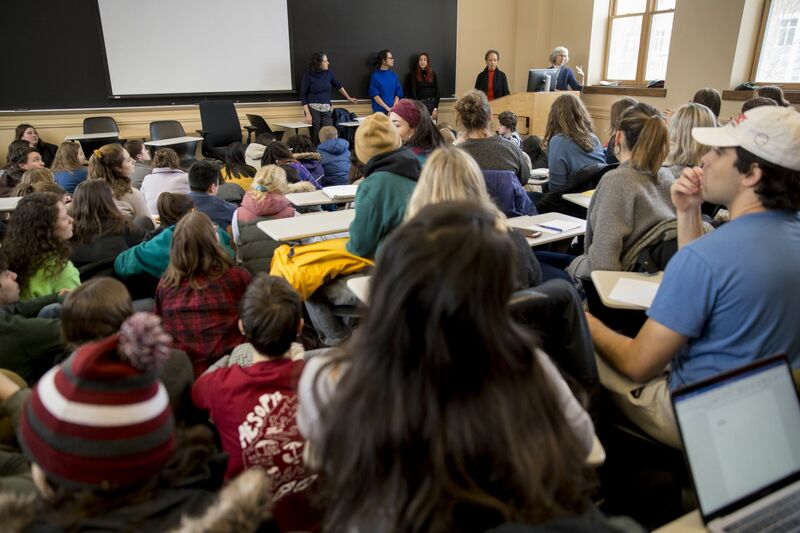 During the MLK Day session, they talked about biases they face at Bates and in Lewiston, the importance of connecting the two communities, and how mentorship benefits both mentor and mentee. “There are not many faces at Bates that look like us,” said McLean, of Providence, R.I. The mentors take their personal experiences, along with academic courses, and “deliver the things we’re learning about to the guys we work with. “The best way to do that is provide that welcoming feeling, that comfort that we have as black men that they don’t have at school. 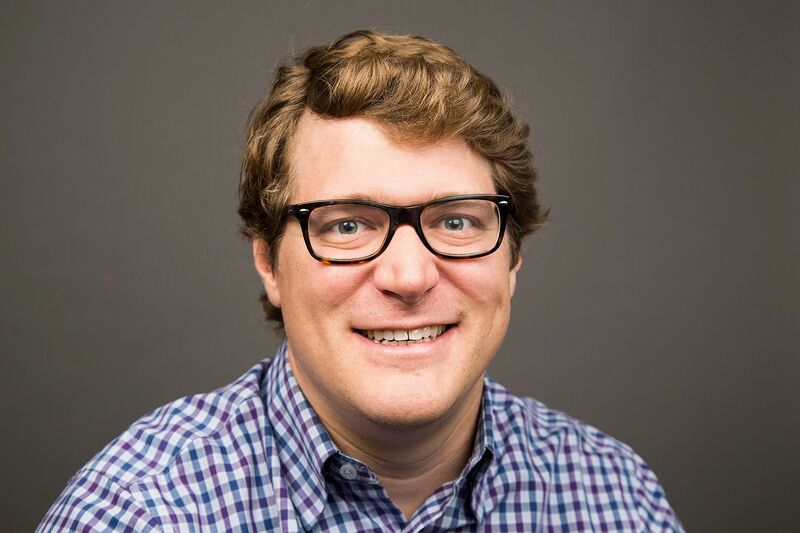 Wade was a coordinator of the workshop “How to Maintain Our Wild Tongues,” which asserted students’ rights to the dialects and non-English languages they were raised in. The session’s title plays on the 1987 essay “How to Tame a Wild Tongue,” by the late scholar Gloria Anzaldúa, who described the English-only teaching practices she experienced growing up in Texas. “Wild tongues can’t be tamed, they can only be cut out,” she wrote. The panelists looked at forces that determine which victims of sexual violence get recognized. In the U.S., González pointed out, domestic work is often regarded as informal. “Employers don’t see themselves as employers, and employees don’t see themselves as employees.” That can have far-reaching ramifications. Kane, also part of the panel discussion “#MeToo Means Who?” commented on an open letter published last year by the Alianza Nacional de Campesinas (National Farmworkers Women’s Alliance) that expressed support for sexual-violence victims in the film industry. Organizer of the panel discussion “#MeToo means Who?” Hill talked about the construction of activism, mentioning the Movement for Black Lives. “They’re constructing a movement in the moment, taking on issues that are important inside their own communities and generating conversations about them,” said Hill. Cheney was part of a panel discussion by Bates historians about the intersection of activism and scholarship in the study of history. A historian of China who concentrates on the environmental, social, and legal history of the Qing Empire (1644–1912), Cheney admits that he has “questions, and a difficult relationship with my responsibility to help change the present” in China. Kibugi led a workshop that offered ways for people who want to be allies do a better job in the fight against oppression and for equity. Toward the end, she and others talked about overcoming the trepidation that comes with taking any kind of new action, and the importance of having a plan. Also part of the panel on activism and historical scholarship, Otim is a Ugandan native who was a journalist and then a communications manager for a relief organization before he became a historian. 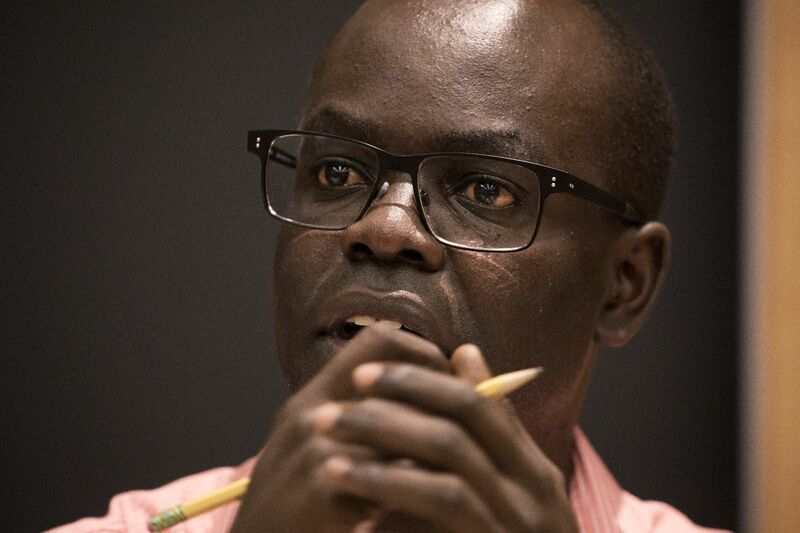 In his work in war-torn northern Uganda in the mid-2000s, he noticed how scholars and others from afar would describe the the Lord’s Resistance Army and its leaders in highly critical terms, yet Otim would hear far different accounts from people on the ground who supported the LRA and who had suffered “real violence” at the hands of the Ugandan army. Now, as a scholar looking at pre-colonial and colonial Uganda from 1850 to 1950, Otim has a similar on-the-ground approach as he examines oral histories from that time period in his research. A historian of Latin America with a particular interest in Cuba and the Cold War period, Baldacci explains that “when you are thinking about complicated things in nuanced ways, it’s hard to boil that down” into a simple activist cause. At the same time, her research in Cuba brings her into contact with contemporary activists, “who are doing really important work” and who also face “real political dangers” as they help Baldacci and other researchers by, among other cooperative acts, providing oral histories.